When an order is placed by the customer, table_id and order number is transmitted to the coordinator and an acknowledgement is sent automatically to that end device i.e. table and a LED is switched ON at the table device. Now once the order is ready, owner presses the respective button to the table whose order is ready, then the LED at end device starts blinking which will be as an acknowledge to the customer saying the order is ready. All these information is being stored in data base and will be displayed by using a projector or any other displaying device. Now if another order has to be placed by the customer then he needs to first press any button to make the blinking LED off and then click the respective button for the order and this repeats. Thus the ordering an item at restaurant is being easier and simpler. a) Intel Pentium based system with Windows XP. b) Keypads for connecting to the Battery Board at the End Point. This is an Touch Screen Based Wireless Home Automation Using Zigbee Technology application that has tables as End Device and the owner as a Coordinator. The number of tables as per this application is 4 and can be changed according to the user’s requirement. Each table has its own unique table_id. This has to be assigned to the end device in order to differentiate each table. The table can place an order having four items ranging from 1 to 4 using the four switches available. Here we are sending 11, 12, 13 and 14 from the four switches respectively where for example in “11”, the first digit is the table_id and second digit is the order. As the table_id must change for all the four end devices, the first digit shall be changed for every table. 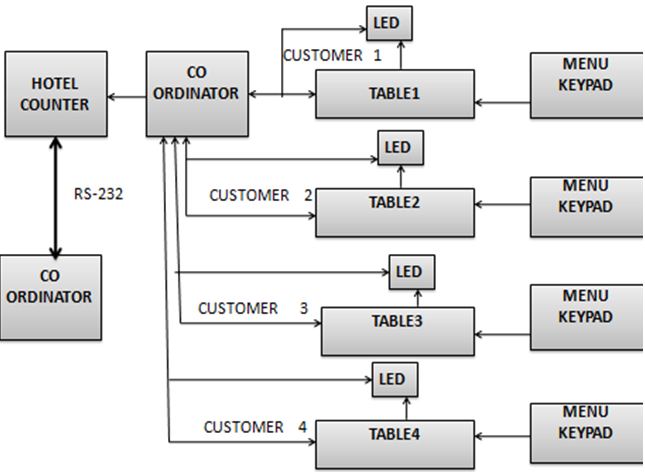 Once the order is placed by the customer, order is being received by the Coordinator and for acknowledgement coordinator automatically sends back a message and an LED is switched ON at the end device. Now once the order is ready, owner presses the respective button to the table whose order is ready, then the LED at end device starts blinking and the food is being served by the waiter boy. All these information will be displayed by using a projector or can also be displayed by any other displaying device. Now if another order has to be placed by the customer then he needs to first press any button to make the blinking LED off and then click the respective button for the order and this repeats. 1) No need of man power. 2) We can save time. 1) The counter and customers are connected in a wireless Zigbee network to make the service more efficient.